THE chilly winter and campaigning mode that gripped Zimbabwe for the past weeks is almost over. With it comes the change of wardrobe, for summer is here, there is a time for everything. Foul-mouthed hate-speeches were literally thrown around with reckless abandon; in the melee, bad breathe oozed, signalling absence of oral healthcare. The high cost of dental care has seen most people only visiting a dentist when a tooth is aching or requiring extraction. Some people have never seen a dentist in their lives. People with very little risk of cavities or gum disease can see a dentist once a year, while those with high risk of dental diseases need to visit more often. However, if one observes good oral hygiene, a visit to the dentist sees one cleaned at least twice a year. In Harare, dental services are not available at most council clinics. Most suburbs refer dental cases to Beatrice Infectious’ Diseases Hospital in Mbare and Wilkins Infectious’ Hospital in Milton Park. With charges for dental care at private hospitals unaffordable to the general populace, oral healthcare by dentists becomes a luxury. Speaking to The Patriot, Marshal Makanganise attributed challenges and lack of dental services by local council clinics as a major driver to high prices charged by private hospitals. 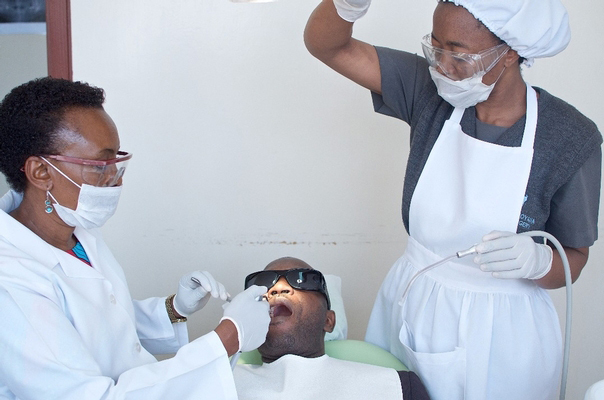 “The cost of dental care charged by private hospitals is high, hence we visit when having a tooth extraction rather than general care as required,” Makanganise said. “With the current hard economic situation, talking of dental visits is a luxury while brushing is the only means affordable all year round. “If council clinics had dental services in the high density suburbs, it would be common to have regular dental care for the majority. According to dental health tips, brush teeth at least twice a day. Choose a toothbrush with a small head for better access to back teeth. Soft bristles are kinder on your gums. Many dental professionals recommend changing your toothbrush every three months. – Use fluoridated toothpaste. Fluoride helps to harden tooth enamel and reduces risk of decay. – Brush thoroughly. Tooth brushing should take between two to three minutes. – Floss your teeth daily, using a slow and gentle sawing motion. – Limit acidic drinks like soft drinks, cordials and fruit juices. – Food acids soften tooth material and dissolve the minerals in tooth enamel, causing holes (cavities or caries). – In severe cases, teeth may be ‘eaten’ right down to the gum. – Limit sugary foods. Bacteria in dental plaque change sugars into acids. – Protect your teeth from injury. Wear a mouth guard or full-face helmet when playing sports. – Try to save a knocked out tooth. If possible, hold the tooth back in place while you seek immediate dental advice. – If this is not possible, wrap the tooth in plastic or place it in milk and seek dental advice immediately. – Avoid using your teeth for anything other than chewing food. – If you use them to crack nuts, remove bottle tops or rip open packaging, you risk chipping or even breaking your teeth. – See your dentist for regular check-ups. You should also visit your dentist if you have a dental problem such as a toothache or bleeding gums. The love of fizzy drinks and sugary foods has seen most people losing their teeth after decaying beyond redemption. In Zimbabwe, imported aloe toothpaste, believed to cure bleeding gums and whiten teeth, among its various uses, have flooded the streets and people are falling for it. The street dentists make a living, risking the health of ignorant and desperate people. Primary health care is a goal that Zimbabwe is poised to achieve as part of the global goals, giving everyone equal access to health. According to the Zimbabwe National Health Strategy (2016-2020), currently, every district has at least two doctors. Every primary health care centre has at least two qualified nurses, 59 percent of administrative wards are serviced by an environmental health technician and 60 percent of villages have access to a village health worker, hence there is need to add dental care so that the health care goal is achieved in all sectors.